PHOENIX – As visitors enter the Heard Museum exhibit “Away From Home: American Indian Boarding School Stories,” they encounter an eye-level digital screen with a grid display of hundreds of school portraits of indigenous students who attended scores of such boarding schools across the United States. Some of the portraits were taken during the late 19th and early 20th centuries. They’re black and white, sometimes sepia-toned, and often are faded near the edges. Others are more contemporary color portraits with hairstyles and clothing that hint at the decade in which the photo was taken. There are smiles and stern faces, long and short hair, gold and pink graduation caps and gowns. As each individual portrait transitions to another, visitors get a sense of scale for the number of Native American students who attended the boarding schools – many of them against their wishes – over 140 years. For Patty Talahongva, a member of the Hopi Tribe and one of the advisers who assisted in the curation and development of the exhibit, seeing those faces brought her joy. She attended Phoenix Indian School during the 1978-79 school year. Cantley said an update was needed. 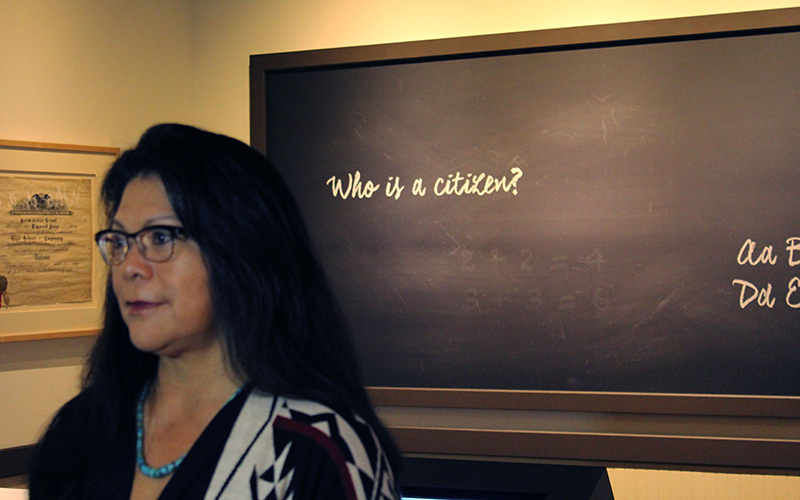 “There’s been a lot of research, a lot of writing and a lot of exploration of the need to heal because of the impact (of boarding schools) on the Native community,” she said, adding that Heard officials also wanted to include more personal stories to the exhibit. “It’s the first person voice, the student voice, that’s essential in telling the history of the American Indian boarding school,” Cantley said. Bryan Brayboy, a professor of indigenous education and justice at Arizona State University and a member of the Lumbee Tribe of North Carolina, saw the original “Remembering Our Indian School Days” exhibit many times. He said that exhibit helped indigenous youth better connect with the impact the boarding schools have had on their communities. Although “Remembering Our Indian School Days” reached the communities whose stories were being told, Cantley said, many Americans simply aren’t aware of the history of Indian boarding schools in the United States and around the world. “People drive up and down Indian School Road in Phoenix every day and don’t know the association with Phoenix Indian School, which has a 99-year history in Phoenix,” she said. The school opened in 1891 with the passage of the Indian Schools Act, which made boarding schools compulsory for Native children, and was the only government-run boarding school in Arizona that was not on tribal land. Phoenix Indian School closed in 1990. To help those who aren’t as familiar with the history of boarding schools explore the topic more easily, some new features were designed and installed. For Brayboy, it was equally important for the new exhibit to maintain a balance. “It isn’t just focusing on trauma, but also focusing on the ways in which there were some positive aspects to the school. Positive relationships that came out of it,” he said. Talahongva said there was no high school on the Hopi Reservation in 1978 and there weren’t many other options. “So I came to Phoenix Indian and I became a P.I. Brave,” Talahongva said, invoking the school’s mascot. As she said it, she smiled and raised her right fist in solidarity with the hundreds of children who, just like her, attended Phoenix Indian School.